Thank you for joining me as we count down to the MFT release. We are four days away from the big day! All the new Stamps and Die-namics will be available on Tuesday, January 9 at 9:00 pm EDT. Be sure to check out the MFT Blog to see all the new items being revealed today. Don't forget to leave a comment on the MFT Blog countdown posts, YOU could win one of the five $75.00 gift vouchers. 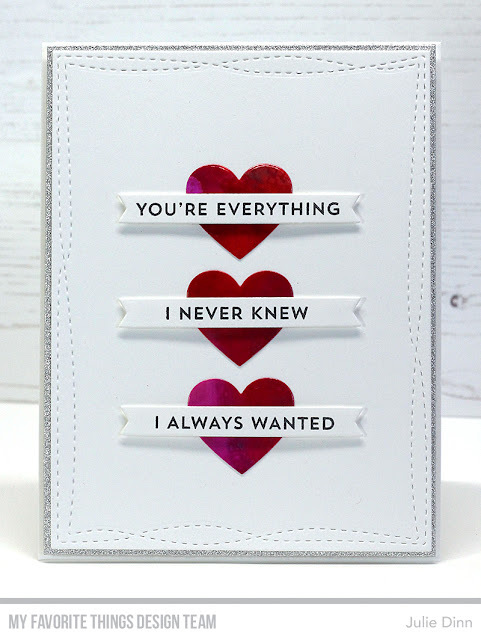 I have a sweet and simple card for you today, it features two of my favorite products from the Janaury release, Hearts in a Row - Vertical Die-namics and From the Heart stamp set. The From the Heart stamp set includes tons of sentiments that you can mix and match to create the most heartfelt sentiments. I stamped the sentiments in Extreme Black Ink on Smooth White fishtail flags. The hearts were die-cut from a print I created with Alcohol Inks. Oh my goodness ! That’s such a great Valentine card ! Awesome new stamp and die sets! I love your layout! Very pretty! Hearts In a Row are fabulous. Love the glittery paper beneath the top layer and the wonky die you used. GORGEOUS!! I love the sentiment you selected!! Very classy with the white and red! The hearts really stand out!